(NaturalNews) Supporters of genetically modified crops have a new darling to advocate, this time under the name "Golden Rice." Touted as a miracle for starving countries, the saffron colored rice is designed to prevent blindness caused by vitamin A deficiency. Once again, the crusade to promote yet more Frankenfare has scientists and mainstream media joining the ranks, lending so-called credibility to the product. Conveniently forgotten, however, are the solutions to hunger and illness which tend to be far superior economically, nutritionally and environmentally. ". . . Syngenta and proponents of Golden Rice are announcing that they will make it royalty free and farmers can use the seeds for free due to humanitarian purposes. However, patents will still be owned by Syngenta, in which they can change the agreement regarding royalty any time." According to the pro-GMO article "Golden Rice: Lifesaver?" in the New York Times, a single bowl of Golden Rice will now provide 60 percent of the daily requirement for vitamin A in healthy children. And "it will cost no more than other rice for poor farmers, who will be free to save seeds and replant them," said Barry. 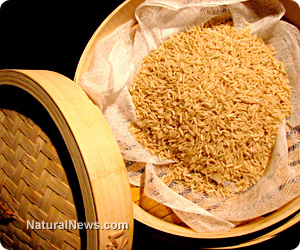 The article continues to state that the rice is void of any known toxins or allergens and the proteins break down quickly in simulated gastric fluid. Scientists also claim that cross-pollination is low due to the self-pollination mechanism of rice. "The amount of money it has cost to concoct a product like Golden Rice is enormous. Scientists first got initial funding for Golden Rice from the Rockefeller Foundation in 1984 and have now been supported (with monies to cover lab expenses, legal fees, teaching assistants, salaries, long patent processes, etc) for more than 30 years." Hoffman continues with alternatives to Golden Rice like kitchen gardening, improved agricultural methods and cover cropping, which provide exceptionally rapid economic and nutritional benefits to farmers. Additionally, she points out that the people in many countries with the highest rates of vitamin A deficiency-caused blindness, such as Africans, are not traditional rice eaters. It would make more sense to encourage switching from white sweet potatoes to orange than to overhaul cultural food preferences. "Why are we pouring money into lab salaries, field trials and professional conferences instead of ensuring that people around the world have nutritious - and tasty (do you want to eat only rice?) - food to eat every day?"